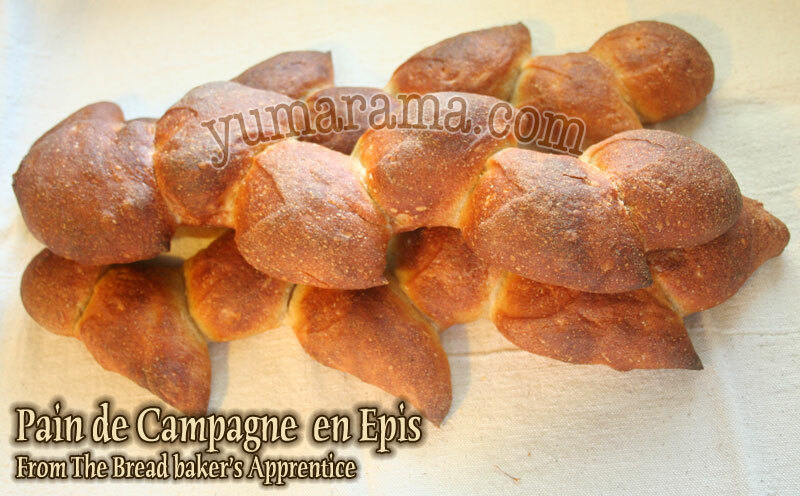 Pain Campagne (Country Bread) is recipe number 22 in The Bread Baker’s Apprentice and we’re now past the halfway mark in the full 43-recipe BBA Challenge. 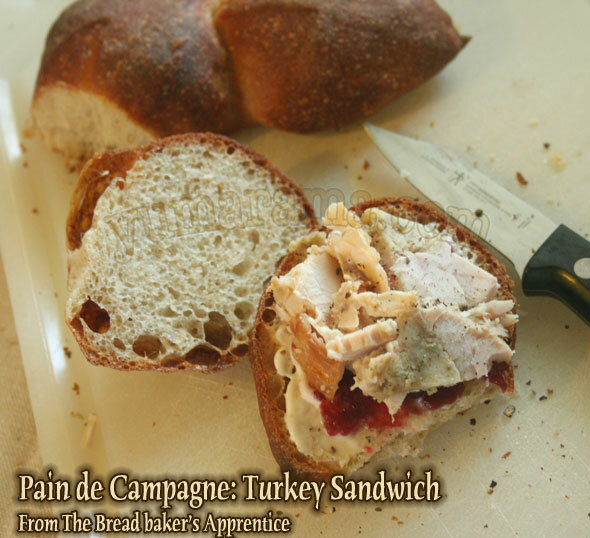 Despite the disappointment of the previous bread, Pain a l’Ancienne, I was looking forward to making this one because it involved some fancy cuttin’ and shapin’ and the techiques we’d learn about here were more on the presentation. The bread itsef still looked interesting. And I’ll say right away that this one did not come out badly. 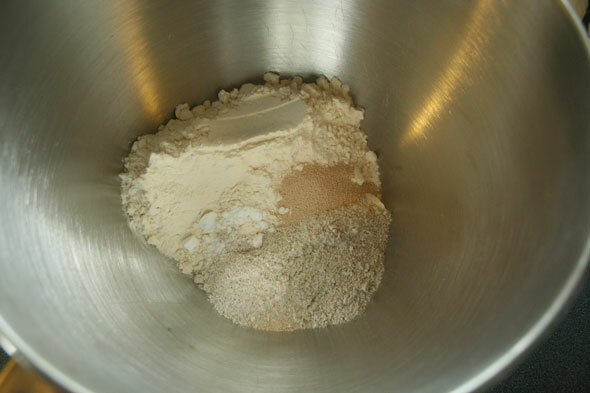 This is a simple lean bread, a mix of rye & unbleached bread flours, salt, yeast and water. 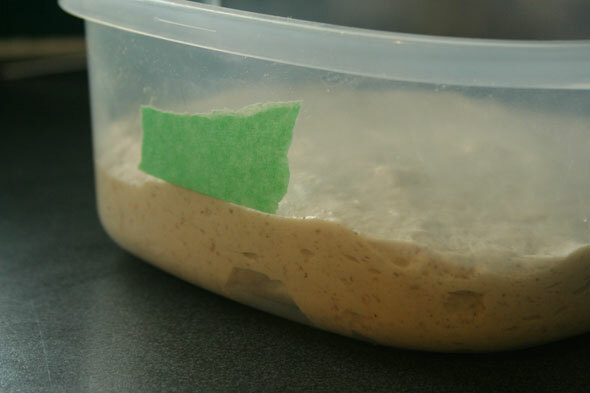 It uses a pâte fermentée that has been rising and refrigerated for about 12 hours to add flavours developed during the slow retardation process. 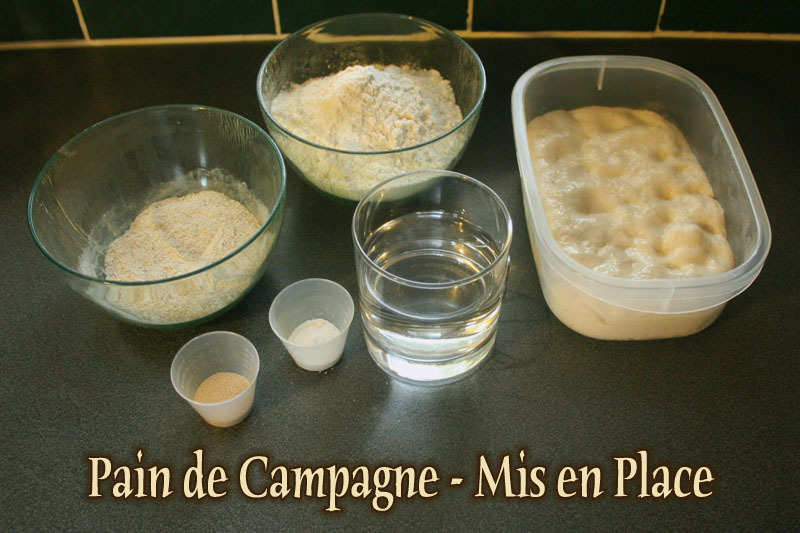 The pâte fermentée added here was also a lean dough: flour, water, instant yeast and salt. One hour before we start today’s bread, the pâte permentée is taken out of the refrigerator, cut into small pieces and allowed to warm up to room temp. Here I’ve chopped the pieces which I’ll then cover with an inverted bowl and let them warm. 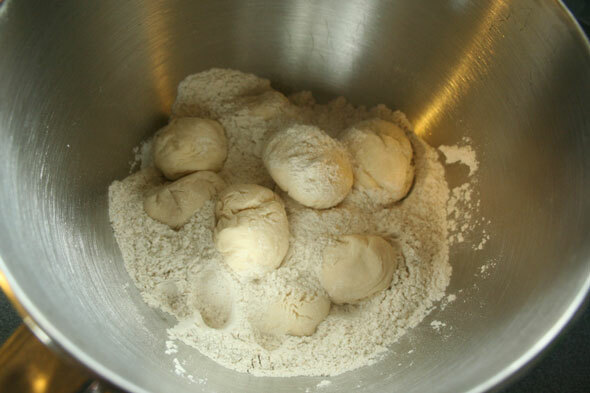 An hour later, I mix the dry ingredients and add the dough balls. After adding the warm (90-100ºF) water, this is then mixed with the paddle tool until it forms a shaggy ball. 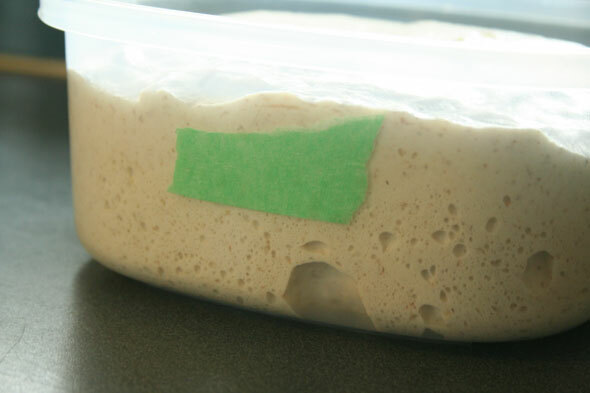 At that point I switch to the dough hook and knead by machine for about 6 minutes (10 if kneading by hand) until the dough is smooth, has reached 78ºF and passes the windowpane test. 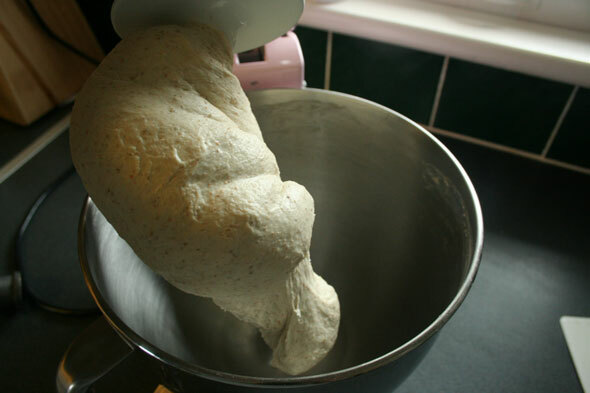 This kneaded dough is then placed in an oiled bowl and allowed to bulk ferment for about 2 hours until doubled. The kitchen was a little on the cool side this day so it took an extra 30-40 minutes to reach double. 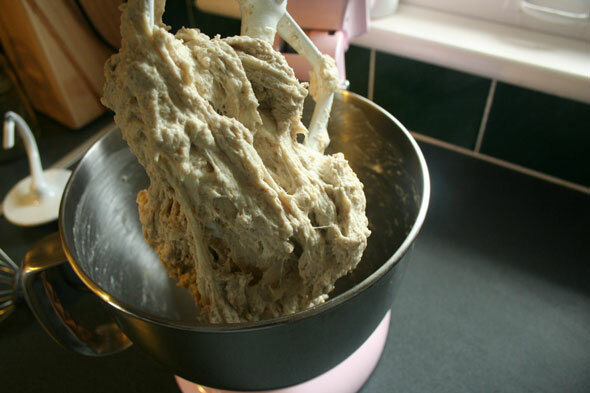 The dough is then turned out onto a lightly floured counter and is ready to shape. Because of timing and other expected kitchen activity (gotta get them beets pickled too!) I decided to do just one shape, the épis (wheat sheaf) so I split the dough into four equal sections and shaped each into a baguette. 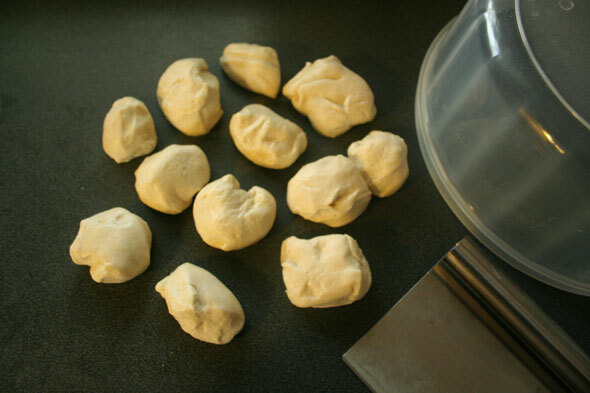 These will go into the oven directly on the pans so there won’t be any transfers from pan to stone. 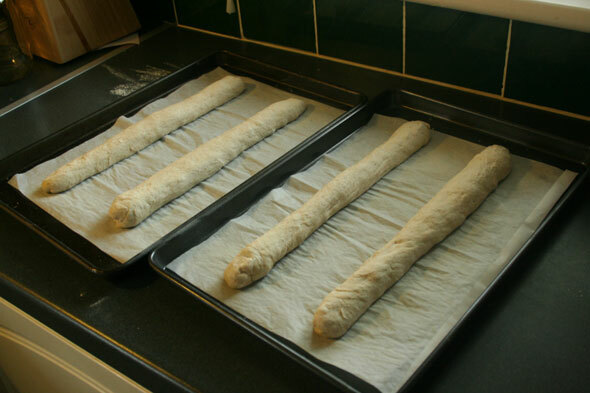 The baguettes are allowed to do their final proof until about 1.5 times their original size, in this case a little over 1 hour. We let the dough tell us when it’s ready, not the clock. As per instructions in the book, I used some kitchen scissors (fresh out of the dishwasher) and snipped up some wheat kernels. 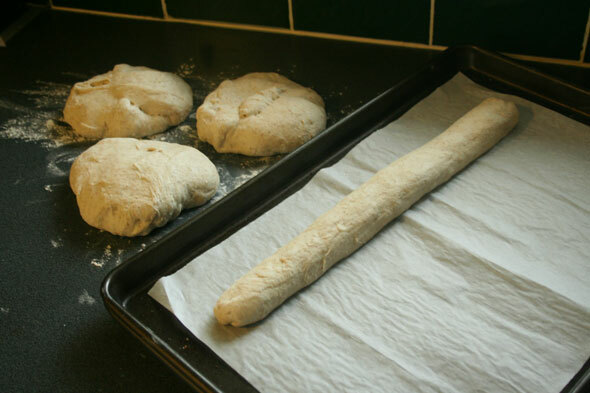 Using the scissors, I snipped diagonally downwards, moving each pointy chunk alternatively let and right as I moved up the baguette. Wanna see it done by a pro (NOT me!)? 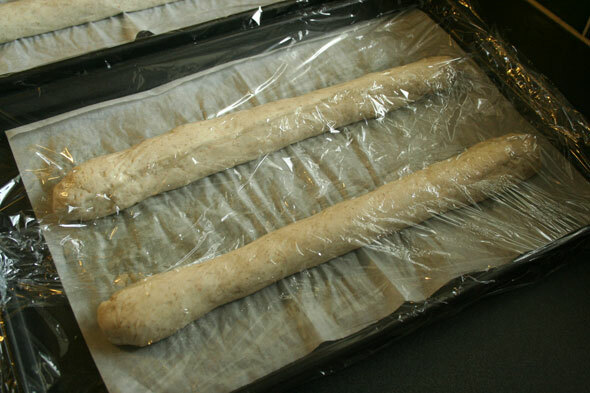 One thing I would do differently next time is make sure to slice just five pieces in this size of baguette (mine were just 40cm or 16″, made long enough to fit 2 per pan) as six made for slightly too small buns. I’d also be a little more careful to make them each of equal size. But, in my defence, this was my first ever try at this so I think the snipping went pretty well this time. These are now ready to go into the pre-heated 500ºF oven with a cup of how water to steam things up. 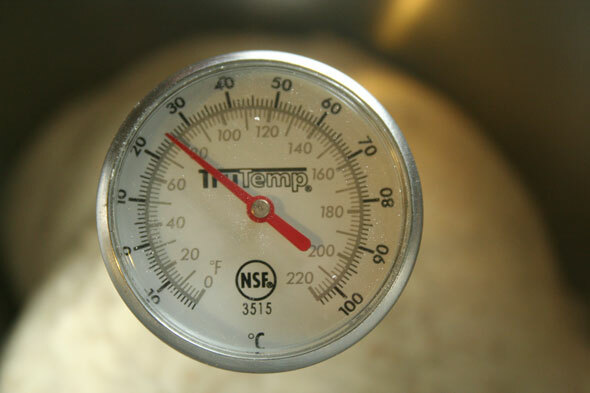 The oven is then reduced to 450ºF and they bake for 10 minutes then get a 180º turn and switch racks (I’ve put both pans in together) to bake evenly and bake a further 10-15 minutes until a rich brown colour and they reach 200-205ºF inside. The laoves looked very nice and were of an interesting shape which doesn’t really translate well in the photos I took. You’ll note there are only three epis in the photo – seems one vanished almost immediately. We had Thanksgiving turkey a little early so have a bit of leftovers to go through. These little buns made great small sandwiches. The bread itself has a good texture although the crust was a bit on the heavy side – I think I left them in the oven a minute or two too long. But overall, this is a very nice bread with lots of flavour, in part from the rye flour I expect and the preferment. This one definitely makes up for the previous flop and goes into the “Do it again!” list. I’ll want to give the “epis” technique another go to get a little more precise in the bun sizes and perhaps try one of the other shapes suggested. Oggi at I can do That! 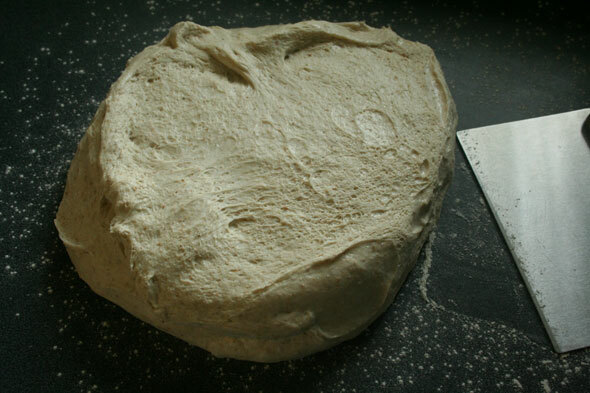 found the shaping fun but the bread itself only so-so. Joelen at What’s Cookin’, Chicago? had a group bake and came up with unique shapes. Carolyn at Two Skinny Jenkins made a lovely rendition of her own. 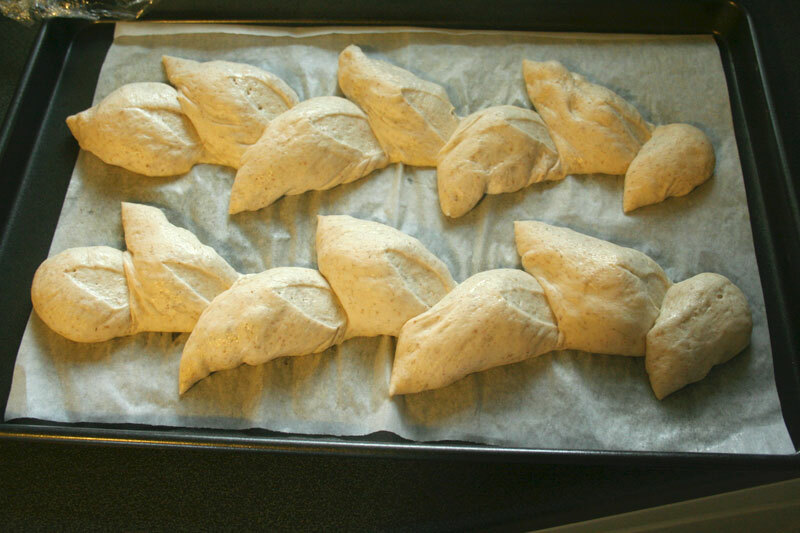 Pane Siciliano, an enriched bread using preferment (i.e. pâte fermentée) and semolina flour. Great lookin epis! Especially nice crumb. It’s good to hear your new busy job won’t be taking you away from the Challenge completely! You’re one of the few people staying ahead of the pack that I could get a preview from! I’ll amend the note. 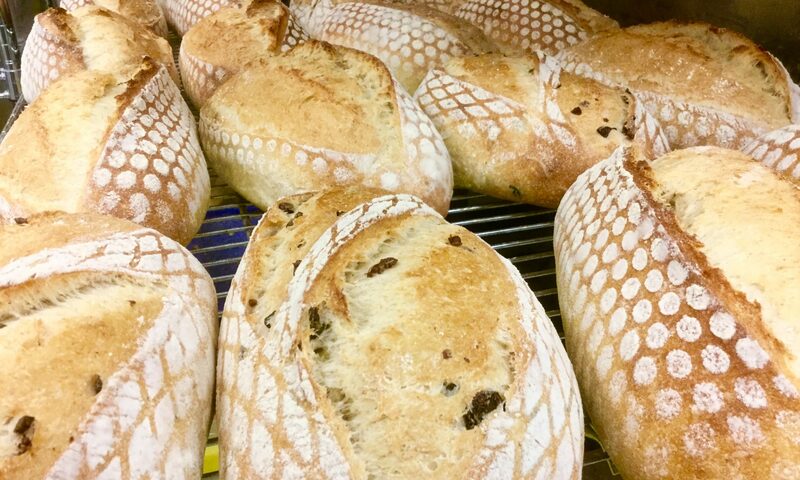 Beautiful loaves! I think you did a fabulous job snipping and shaping them. I’m looking forward to making this bread as well. Still trying to decide which shape to make. Wish me luck! Nice job! I like your epis. I made mine today: epi, crown, and hat shapes. I used sourdough starter in place of the yeast, and mixed rye and whole wheat flours. Very tasty. Beautiful epis and what a great crumb! 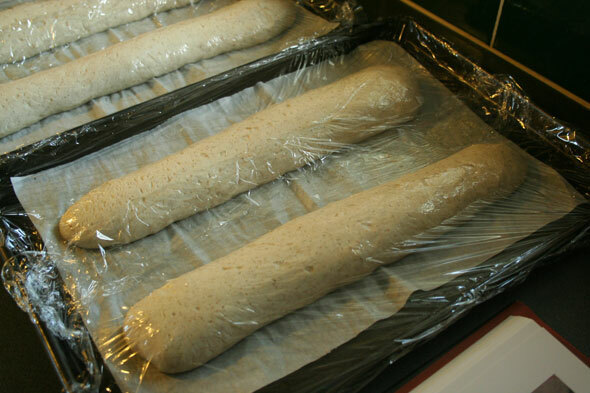 This is the next bread I will be baking so it was great to have your blog and the video you posted for reference. Absolutely beautiful Epis. I ended up giving mine away, but I did have fun shaping it. Maybe I should have taken your lead and only done Epis. Previous PostPrevious Pain a l’Ancienne or Giant Grissini?